A current clamp may refer either to a current clamp meter or a current clamp probe, or both. 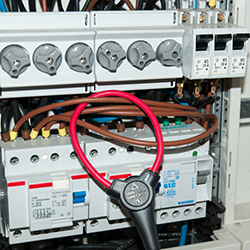 A current clamp is used to measure current in scenarios where splitting the circuit with a digital multimeter isn't possible or where the current in the electrical power supply system is so high that a contact current measurement is unsafe. PCE Instruments' (PCE) current clamp meters typically feature a built-in current clamp component. If not, a current clamp probe is included in the delivery contents of most models. For those current clamp meters without a built-in or included current clamp probe, PCE offers standalone current clamp probes for use with different current clamp meter and digital multimeter products. With so many current clamp products and solutions, it's no wonder so many electrical contractors and electronics manufacturing professionals turn to PCE for safe and affordable current clamps to meet their diverse electrical testing and inspection needs. PCE's wide selection of current clamp offerings accommodates nearly any electrical current measuring application. If you have any questions about the current clamp products listed on this website, please contact PCE's friendly and knowledgeable technical support staff at or +44 (0) 2380 987 035 for PCE Instruments UK, or at or +1 (561) 320-9162 for PCE Americas Inc. The Three-Phase Current Clamp (Graphic Power Quality Analyzer) PCE-GPA 62 is used for single-phase or three-phase measurements of the active, reactive and apparent power, power factor, phase angle, energy, voltage, current as well as peaks and harmonics. This current clamp is used for single-phase or three-phase measurements of the active, reactive and apparent power, power factor, phase angle, energy, voltage, current as well as peaks and harmonics up to 50º of the harmonic waveform. The current clamp is equipped with data logger. The test instrument is delivered manufacturer calibrated (ISO or certification as an option). The PCE-CM 3 current clamp is used for quick and easy AC measurements. For current measurement, the PCE-CM 3 current clamp is plugged over the live conductor. The current clamp PCE-CM 3 is particularly suitable for the measurement of alternating current in distributions and wherever circuits must not be interrupted. The PCE-DC1 Current Clamp has been designed to detect, indirectly, AC/DC current and frequency. The Current Clamp has a flashlight integrated to allow for the point of measurement to be illuminated, and a function to test the voltage without contact. This Current Clamp has been developed to determine indirectly, the AC/DC currents with high accuracy. A non-contact Current Clamp and a torch to illuminate the area being measured, have been integrated into this device. PCE-PCM 1 is a multipurpose current clamp or power analyzer used to measure alternating current (AC), voltage (TRMS) and frequency to determine active (kW), apparent (kVA) and reactive (kVAR) power as well as active energy (kWh) consumption. Both the phase angle and the power factor (cos φ) are shown on the handheld power meter's large and easy-to-read backlit display. With the PCE-LCT 1 Current Clamp it is possible to measure leakage currents up to a range of 100 A. PCE-LCT 1 Current Clamp can measure leakage currents which appear when current flows through electrical conductors which are not designed for conduction current. The current clamp PCE-DC 41 can measure voltages up to 600 V, currents up to 600 A and electrical resistance up to 1000 Ω. To perform a measurement, you can either use the measuring leads, which are included in the package of the current clamp, or you can use the integrated clamp mechanism. By using the clamp of the current clamp, you are able to measure the electrical parameters of an electrical conductor contact-free and without disconnecting it. This current clamp was developed for the indirect acquisition of AC / DC currents as well as the frequency. A non-contact voltage tester function and a flashlight for illuminating the measuring point were also integrated in this current clamp. Current clamp for measuring AC/DC current, AC voltage and resistance. This current clamp is designed to indirectly detect AC/DC current and ohms. The current clamp has white LEDs which illuminate the point of measurement and test the voltage without contact. Small dimensions of this device allow to take measurements in places with limited access. The current clamp comes manufacturer calibrated and can optionally be certified according to ISO or standards. Current clamp to determine indirectly, the AC/DC currents with high accuracy. The current clamp PCE-DC 41 can measure voltages up to 600 V, currents up to 600 A and electrical resistance up to 1000 Ω. To perform a measurement, you can either use the measuring leads, which are included in the package of the current clamp, or you can use the integrated clamp mechanism. By using the clamp of the digital current clamp, you are able to measure the electrical parameters of an electrical conductor contact-free and without disconnecting it. With the PCE-PA 8000 Current Clamp you will be able to perform prolonged measurements of electrical properties. The measurement data is saved in xls format on the included SD card to be easily transferred to a computer or laptop for review. The Current Clamp comes manufacturer calibrated and can be certified to ISO or UTIL standards as an option. The PCE-360 is a Current Clamp with data logger functionality. This versatile power analyzer can take single-phase and three-phase power measurements both in real time and over an extended time period. The PCE-830 Current Clamp is used for measuring one to three phases of electrical quantities for alternating current (AC). This Current Clamp also measures parameters such as voltage, current, frequency, harmonics, and power as well as indicating, according to standard EN50160, harmonic values, interharmonics, and asymmetrics. Interference, such as interruptions, leaks, overloads, or transience (from 16 µs) are detected with their corresponding values. The power logging instrument is delivered manufacturer calibrated. An ISO calibration certificate may be ordered optionally. Current Clamp for multimeter to 150 A AC, Æ max. 10 mm, different output signals. 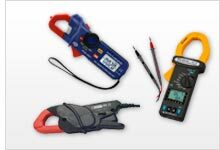 Whether you need an all-in-one current clamp meter or you are looking to acquire a current clamp probe or adapter for use with your digital multimeter, PCE Instruments (PCE) has an electrical current measuring solution for you. To help you identify the right current clamp product for your application, PCE’s technical support team has put together the following guidance. The first aspect to consider when purchasing a current clamp product is the nature of the current to be measured. While alternating current is prevalent throughout the electrical grid due to its ability to distribute power efficiently at low voltages across long distances, direct current is found in many practical applications from flashlights to motor vehicle engine starters. Traditionally, a current clamp is used to measure alternating current. However, most modern current clamp meters are capable of measuring both alternating current (AC) and direct current (DC). So, the good news is, your basic electrical current measuring needs should be met by a contemporary current clamp. However, for safety, you also must consider the total amperage the current clamp can accommodate. The maximum amperage or current range of the current clamp should be listed in the device’s technical specifications. For practical applications requiring a wide current range, often a Rogowski coil is used. A Rogowski coil is a rope-style current clamp or current transformer capable of taking non-intrusive AC measurements with better linearity. The flexible design of the Rogowski coil allows for placement in tight quarters such as electrical panels. In addition to flexible Rogowski coils, different current clamp meters offer different features. For example, some current clamp meters feature an inrush function. With the inrush function, the starting surge of current that flows into a motor can be determined. The inrush function also can be used to assess the current requirements of a system that supplies power to a series of machines. Other current clamp meters have features for measuring parameters such as AC/DC voltage, resistance, continuity, capacitance, frequency, power factor and temperature. For many contractors working in the field, a multipurpose tool is desirable to help streamline the contents of their toolboxes. Should you require additional assistance in selecting a current clamp product, please don’t hesitate to contact the PCE technical support staff at or +44 (0) 2380 987 035 for PCE Instruments UK, or at or +1 (561) 320-9162 for PCE Americas Inc.